One of the best looking of all of the vegetables, eggplants are easy to grow and come in a number of varieties. From the large purple skinned types to small white varieties, they are a wonderful vegetable for a range of cuisines. It is both the flavour and the texture that they are grown for. Different varieties require different amounts of space, so work this out before planting. A little attention to position and soil preparation and you will soon the producing the most wonderful tasting eggplants. A sunny position is essential and in cooler climates delay planting until the soil has warmed up in spring. Check out the soil and dig in some well rotted compost and animal manure along with a little lime well before planting. Remember that eggplants require a fair amount of water so a humus rich soil that will retain water and a good mulch on the top is ideal. Many keen gardeners will collect seed and grow plants each year, however it is easier to grow from seedlings, this avoids germination problems and snail eating young shoots. However many more varieties are available from seed. You can germinate you own seeds using a heated propagation tray. For this you can sow the seeds in late winter to early spring and then plant out the seedlings as the weather warms. The first thing to consider is that eggplants like warmth, warmer than tomatoes to which they are related. Planting time is important and they should not be planted into the garden until the weather has warmed up. Mid to late spring as a rule. These are also a large growing plant, you can grow them in a container, however they are best in the garden. Eggplants require a humus rich fertile soil. Start by preparing the soil a month before planting. Dig in good amounts of well rotted compost and some aged cow manure. Make sure that the soil is free draining, as although they like moisture they do nor like wet soggy soils. In our sunny position after the soil is prepared we are ready to plant. Seedlings are planted at around 50 cm apart for the large growing types. Once you have planted the seedlings you should mulch around them with something like pea straw. This will help keep weeds down, retain moisture and keep the soil warm. We always like to water in well with a liquid seaweed fertiliser, it really promotes good root development and gives the plants a ‘flying start’. After planting and watering remember to mulch around the eggplants well to retain that moisture. Once the flowers begin to form its time to fertilise. You can use something like seamungus, or maybe dynamic lifter. Water before fertilising and again after. From planting the seedlings to harvest will take around 12 weeks. If you are growing eggplants from seed, sow them using a heated propagation tray, indoors, or in a greenhouse 4 – 5 weeks before they will be planted out. We suggest planting the seeds in biodegradable jiffy pots. Then you can simply plant the whole pot. Seeds will need moisture and warmth as well as good light to germinate. You can use a propagation tray that provides some bottom heat if you wish. Every week we water with seaweed fertiliser and once the fruits begin to form we increase the watering as they really need it at this time. Major problems are caused by poor air circulation, cold weather in early summer and lack of pollination of flowers. Frost will knock the eggplants over, so avoid frost prone areas. Hot dry weather, prove a little protection from the sun to prevent burning of foliage. 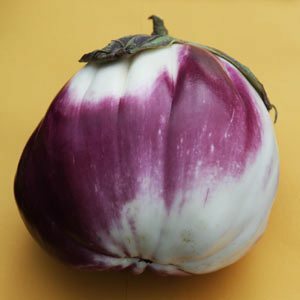 The fruit of the eggplant is ready to harvest when it is plump, smooth and glossy, but try to harvest before the seeds start to form as the eggplant seeds can make fruit bitter. Generally harvesting is 8 – 12 weeks from planting seedlings. Snip the ripe fruits off with some scissors or secateures rather than pulling them off the plant. Eggplants are a favorite in Indian, Egyptian, Greek (moussaka), Italian and French (ratatouille) Cuisine. Yes some eggplants do look like eggs, especially the small white ones, however most are a purple colour. Remember that eggplants will grow well with tomatoes, however this also means that you need to pliant them in a part of the garden where no eggplants, tomatoes or potatoes were grown the previous year. Some varieties are used as ornamental plants because of the interesting fruit shapes and colours. Varieties range from the well known large black eggplants, to small white eggplants. ‘Black Beauty’ is a traditional large purple variety while ‘Snowy’ is an elongated white variety. Eggplant seeds and seedlings are available for sale online and from retail nurseries. ‘Japanese White Egg’, ‘Casper’ and ‘Easter Egg’, yes the white ones.